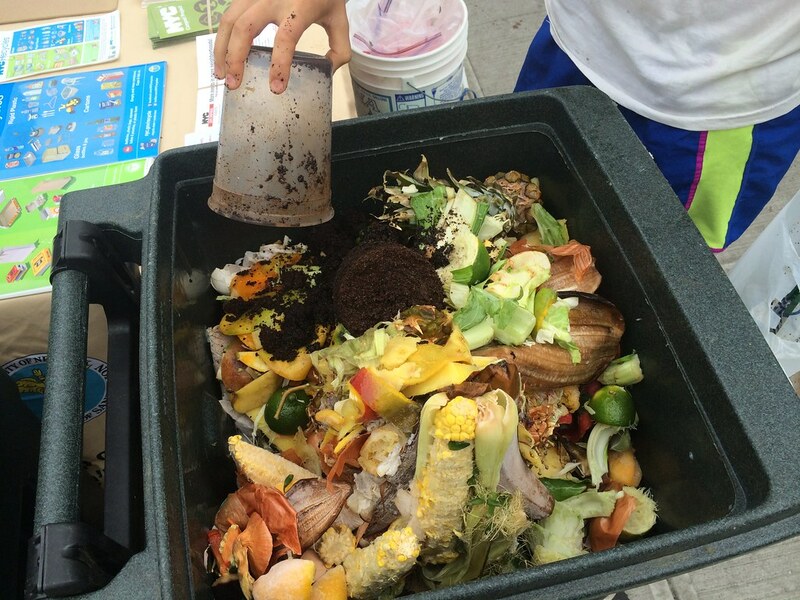 At NYC Compost Project food scrap drop-off sites, New York City residents can bring their food scraps to be composted. NYC Compost Project staff set up these sites on street corners or other public spaces on a regular basis to provide people with an opportunity to recycle their food scraps. Franklin Ave: Franklin Avenue and Eastern Parkway, north corner, near the entrance of the 2, 3, 4, 5 subway station. Red Hook Community Farm: 103 Otsego Street, near IKEA Brooklyn. Composting information is located at the southwest edge of the farm. In case of severe weather, food scrap drop-off sites may close early or be canceled. Sites also close on national holidays. For a comprehensive map of all the city’s drop-off sites, please visit the website of the Department of Sanitation. By advance arrangement, the NYC Compost Project also accepts your leaves, wood chips, wood shavings, hay, straw, and other carbon-rich “browns.” Please contact us to coordinate a delivery or pickup. Tip! A convenient way to keep food scraps for composting is in a paper bag or reusable container for storage in the freezer or refrigerator. Freezing helps to avoid issues such as fruit flies and odors in the kitchen. If freezing is not an option, line a reusable container with paper towels or newspaper. (We do not accept compostable bags because they won’t break down in our composting system.) At the drop-off site, empty your food scraps into the bin. Paper bags and soiled newspaper can also go into the bin. Plastic bags can be used but must be disposed of in a separate trash receptacle to be sent to a landfill, so please use them only if needed! What Happens to the Food Scraps? The food scraps collected at the Brooklyn drop-off sites we operate are composted by NYC Compost Project staff at Added Value’s Red Hook Community Farm. The finished compost is used on-site to help grow organic vegetables and herbs and at a nearby satellite farm on NYC Housing Authority property. Brooklyn Botanic Garden's compost program at Red Hook Community Farm is recognized as the largest community composting program in the United States that runs exclusively on renewable resources—either human power or solar power—and has more than 1,900 volunteers each year. This completely revised edition of BBG's bestselling handbook Easy Compost, updated with a new focus on urban composting, remains an essential guide to the science and art of this green practice. From edible landscaping to street tree care, Brooklyn Botanic Garden training supports the greening efforts of Brooklyn’s communities.